This week's five speed sessions and early rises have taken it's toll. Up at 6.30am, as I wanted to get my long run early. 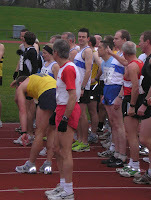 Marco's doing the East Kilbride 10K later, so I'm off to cheer him on. I set out with the intention of running 16 miles, but decided to cut it short and aim for quality rather than quantity. Ran the challenging 10+ miles of the Balloch Horseshoe. Great hills, nice scenery (when it finally got light) and perfect weather conditions. Home - round the circuit - corner in Bonhill in 1:17:45. Back home in 1:26:03. Now I'm off to the land of the roundabouts. Oh the glamour.